Formalise a roadmap for scaling up, taking account of available (human and organisational) resources. Digital technology is not the core activity of the local authorities, even though they have legitimacy for defining political and territorial orientations. The production of the new digital services may be more efficient if performed by specialists. However, it is up to the local authority to make strategic choices in the light of their needs and internal resources and on the basis of pilot actions (previous step) to endeavour to change the scale by generalising or duplicating the actions tested. We are dealing here with the way the local authority can affirm its digital leadership, by defining the norms and priorities that will guide and encourage the digital initiatives carried by the stakeholders in the local digital ecosystem. The action of building digital capacity specific to the local authority is dealt with in part C.
Digital tools and solutions are far from uniform: from perfected drones to a page on a social network, the reasons to have recourse to them, the modes of use and the impacts vary. The choice of a digital solution therefore depends on the use we wish to make of it: it is important to establish a quick panorama of the types of infrastructure and tools that exist (schema 4) before selecting them depending on the level of digital maturity of the territory, the type of approach and expected results, and the financial investment capacities and management by the local authority. From schema, choose one or more affordable digital tools that the local authority can encourage (commission) or develop directly. The local authority has a role in supervising digital initiatives to make them sustainable, effective and inclusive. It is a question of first of all creating the conditions favourable for the generation of new tools at the service of the projects and policies carried by the local authority and propitious to securing a form of construction of municipal action that is more open and more partner-based. Most of the innovations in the developing cities are currently emerging from the private sector or civil society. It seems in the first instance more strategic that the local authority positions itself as the promoter of digital innovation (intervening in the priorities and orientations year after year), facilitator of alliances and guarantor of the public interest by indicating to the third party stakeholders the challenges encountered to find digital solutions. Run an ecosystem and foster synergies: the opportunities offered by digital technology sometimes turn up unexpectedly, with domino effects in other sectors (for example, the digital mapping of vulnerable neighbourhoods contributes to better urban planning, anticipating natural disasters, developing forms of citizen participation, easier tax collection, etc.). It is up to the local authorities to anticipate the external and cross effects, and to transform them into opportunities around a jointly defined development goal. Anticipate how to scale up: very often the isolated solutions developed in a fragmented manner can make it difficult to integrate the data generated. In order to avoid redundancy of human, technical and financial efforts, right from the beginning it is important to define a common, consistent framework which is flexible enough to be able to gradually incorporate new developments. To do so, it is necessary to prepare the recovery of raw data and source files according to predefined standards. Define and adopt norms and standards: the use of free software and the introduction of open data avoids dead ends when the information generated by digital technology cannot be shared or used for other purposes. In parallel, the adoption of a municipal charter defining the principles of the use of digital technology for sustainable local urban development may incite and guide initiatives that are otherwise autonomous. Thematic experimentation programmes to guide and stimulate the prototyping of solutions by young entrepreneurs. Paris&Co is the economic development and innovation agency of the city of Paris. It specialises in the themes of attractivity and innovation to create jobs and economic value. Urban Lab is the urban experimentation laboratory of this agency. Its mission is to organise and accompany innovative solution experimentation projects on Parisian territory, and in this way help entrepreneurs test their prototypes and services in a real situation. Paris&Co proposes a micro-donation and technical support to the entrepreneur for testing in real conditions, evaluating and then deploying. Launched in partnership with the city of Paris once a year, programmes explore a theme by selecting a dozen experiments for each edition. The city chose to experiment thematically smart urban furniture (2010-11), improved air quality (2017-2018), convenience retail (2015-2016). An evaluation, outsourced and performed by evaluation specialists, offers global teaching on the levers of success and obstacles to innovation on this theme. Based on more than ten experimentation programmes launched in partnership with the City of Paris since its creation in 2010, Urban Lab maintains preferential relations with the operational departments of the city, and with the offices of the deputy mayors. A city commits to innovation by defining one theme each year and financing and supporting the winners selected from calls for projects. An ad hoc structure is financed by the city and some committed companies of the territory. Hackathons: these episodic events bring together, over a short period, volunteer computer developers who programme solutions from the databases made available to them. To do this, the community of developers must be sufficiently active for collective emulation to produce results. Open innovation: a more long term approach, a process of opening reflection on a problem to outside partners to find a new solution. The issue is to encourage private enterprises, universities, start-ups and NGOs to cooperate, in an atmosphere of trust, around a collectively-defined problem. Call for innovative projects: the local authorities can open a call for projects if they have adequate funding capacity to support the initiatives selected. These calls for projects may concern a specific issue or be open in order to incite original proposals. Reciprocally, an authority may respond to calls for ICT-based projects, at national or international level, to take advantage of funds, mentoring and technical support. Intrapreneurship Intrapreneurship Neologism used in management, contraction of “intra” and “entrepreneurship”. It aims to allow major companies to create internal structures to innovate, to compensate for institutional inertia. It covers either a mechanism by which individuals create a new integrated organisation combining with a major company, or an approach that allows the creation of a special team of employees within the organisation by granting them autonomy and special responsibilities. , internal change and innovation: digital innovation is not necessarily external to the public sector. An administration or a public body may initiate their own approach to the digitalization of procedures, data, or even the promotion of innovation internally (Part C).This makes it possible to remain in control of the process, but must not exclude the third party stakeholders concerned by the development of a product from the reflection and the implementation. Dedicated digital structure: this may be a municipal department, an agency, a joint venture or a public enterprise. Such a structure will have the mission of running the local ecosystem, but also of rallying investors, defining the sustainable development goals to be pursued, identifying the problems and challenges of the territory, managing the databases and ensuring their public sharing, and lastly developing access to digital technology (see Part C which expands on this). Labels or prizes for rewarding any particularly innovative initiatives from time to time. The organisation of salons or forums can help to run and promote the local ecosystem. Forming alliances with partners can increase visibility and reduce costs. The specific support mechanisms for start-ups and other third places Third places Correspond to social environments other than home and work. These are physical spaces where individuals can meet, come together and exchange informally in response to the needs of a community present. Third places all have their own personality, depending on their location and the community that is present there. Co working spaces are considered specific third places. favourable to digital innovation are presented in part B in the domain of local economic development. An annual competition for start-up entrepreneurs located in Johannesburg. In South Africa, the development of ICT is seen as a lever for improving productivity and green growth in an urban environment. In 2014, Johannesburg council launched a hackathon to elicit innovative ideas in digital formats to resolve the challenges of the city. It is a capacity-building programme to support the creation of jobs and entrepreneurial development, particularly of small businesses. The ten winning participants are selected following a competition during which they have access to mentoring, technical support and networking. The first prize is 1 million rand (almost 70,000 euros); the following two are 350,000 rand each. This initiative grew in partnership with the University of Witwatersrand (Wits), the Joburg Centre for Software Engineering (JCSE) and Seed Academy business school. By creating the opportunity of a hackathon event and emulation by seed funding, the city of Johannesburg helped revitalise the local ecosystem of start-ups. An inventory of the technical, human and financial resources available that could be rallied for the local authority gives an idea of the types of actions and funding they could commit for scaling up. Availability of data: how can data be made accessible to the local authority, how can third party stakeholders be given access to data to develop new services? How can some data be made open? Innovation agenda: how to target, depending on resources, actions supporting digital innovation? Towards which co-funders should we turn? Is there a municipal team or a small in-house group familiar with or interested in digital innovation? Is it possible to release funds to finance open innovation events and subsidise start-ups for developing a prototype? 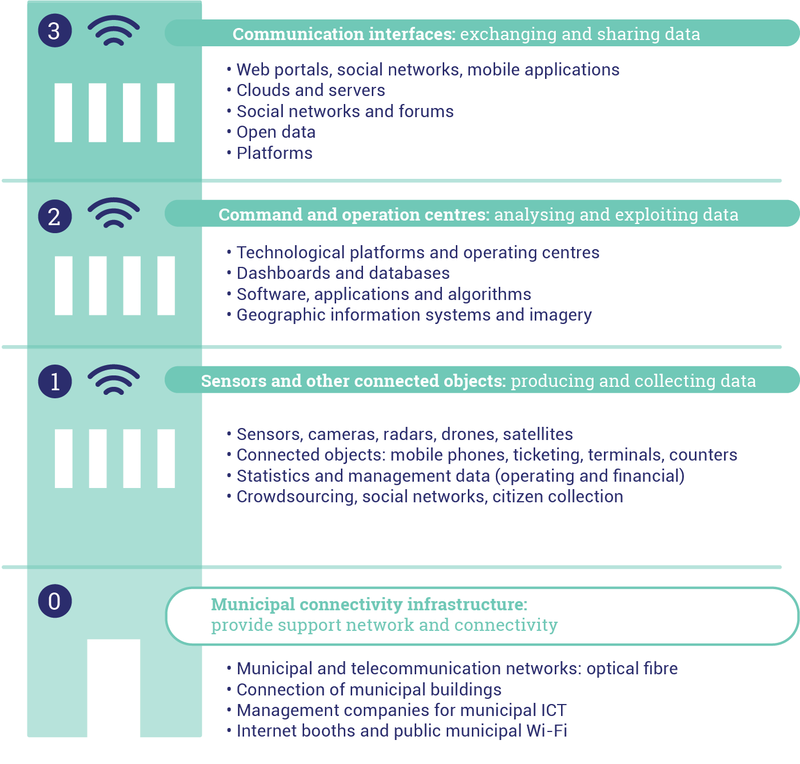 Are there any possibilities of funding to undertake investments in local infrastructure (Wi-Fi terminals, for example, GIS GIS Geographic information system: system designed to gather, store, process, analyse, manage and display all types of spatial and geographic data , servers to host production)?